New weight loss products become available all the time. Few of them stand out or seem to be particularly special and in the majority of cases they simply do not work. Supersculpt and DietVits are two of the more recent additions the market and although the manufacturer, Gravitate, is also new on the scene, both products caught our attention because they appear to be very different from most competing products. For one thing the products are combined to form a weight loss kit. 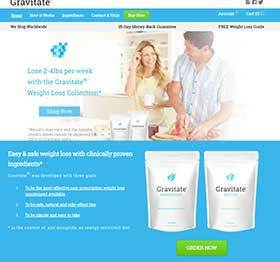 When Gravitate developed their weight loss formulation a lot of ingredients were involved. So rather than cut back on the inclusion rates or produce a pill the size of a horse tablet they split the ingredients between Supersculpt and DietVits and decided to market the duo with the concept that two halves make a whole. It’s pretty radical thinking but we like it. Gravitate Nutrition have produced 2 products that can be purchased individually or as a pair. There is a 35 day money guarantee on all purchases. The product is produced in the UK but ships to all destination (in most cases free of charge) including Canada, The US and Australia. We also like the fact that Gravitate have put together a free diet and exercise booklet and distribute it as part of the kit. Most people who want to lose weight realise diet and exercise are important, but don’t know where to begin. Gravitate customers can begin by opening their free booklet and taking the offered advice to heart. Okay, this looks a little odd at first blush. 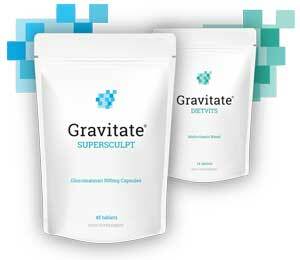 Gravitate decided to split their ingredients between two pills, but Supersculpt only contains konjac (glucomannan). This is not nearly as ridiculous as it looks. Konjac is one of the most powerful appetite suppressants in the world and its abilities have been endorsed by the European Food Safety Authority, but each dose needs to be quite hefty to deliver results. The EFSA recommends 1000mg, taken three times a day. They also state konjac has to be consumed with 1-2 glasses of water around half-an-hour before eating a meal. Bearing this in mind, Gravitate’s usage instructions are bang-on and each two-capsule dose will deliver exactly the right amount. But what about all those vitamins and minerals? Are they really likely to help anyone lose weight? Well, we think Gravitate have done a pretty good job here. Konjac is such a good appetite suppressant people who take Supersculpt should find they are eating considerably less food, so it is possible they may not get all the vitamins and minerals required to maintain normal good health. DietVits certainly appears to be capable of making that problem disappear. We know what you are thinking though: What about the carb blocking, the faster metabolism, and all the extra energy? Where does all that other good stuff come from? The carb blocking will be provided by the konjac in the Supersculpt capsules because it appears to be capable of slowing down the rates at which carbohydrates are absorbed through the walls of the intestines. Carbohydrates that are not absorbed do not release their calories, so konjac comes to the rescue again. If you take a close look at the list of ingredients you will notice several B Vitamins and if you know your stuff you will realize folic acid and biotin are B Vitamins as well. B Vitamins help the body extract energy from food, so they should help prevent dieters from losing the zing they need to get them through the day. B Vitamins also help keep the metabolism in tip-top shape and this is much to be desired because the metabolism regulates calorie burning speed. The metabolism also requires a sufficient amount of “T” hormones and the iodine in DietVits should encourage the thyroid to keep pumping them out. Chromium keeps blood sugar levels in check and calcium also appears to be useful for weight loss. DietVits is pretty good product. We are impressed. Supersculpt Capsules: Two capsules are required three times per day and you will need to take them with 1-2 glasses of water 15-60 minutes before eating a meal. DietVits Tablets: You only need one tablet a day and you can take it whenever you want as long as you take it with food and water. None of the ingredients are likely to cause any problems when used by people who are in normal health, but Gravitate diet products are not intended for people who are under 18-years-old. People who have existing medical problems, and people using medication, should consult a doctor before using either product, as should women who are pregnant or nursing a child. If you are looking for an effective weight loss product, that does not contain stimulants or other nasties, Gravitate’s weight loss kits should be just the ticket. We only have to take a look at the ingredients to know the potential is there. Bearing in mind they are a new company, Gravitate deserve a pat on the back. They’ve played a blinder. Their weight loss kits should easily outperform the majority of competing products. If you want to buy a buy a Gravitate weight loss kit and give it a try you will need to visit the manufacturer’s website. Its not possible to buy the kits anywhere else, but the prices are reasonable, and Gravitate offer a 35 day money back guarantee. This entry was posted in Appetite Suppressants and tagged DietVits Canada, Gravitate Diet Pills, Gravitate Nutrition Canada, SuperSculpt Canada, SuperSculpt Diet Pills by admin. Bookmark the permalink.